Rabbit Stew: Hunter/Blogger: Image too disturbing? 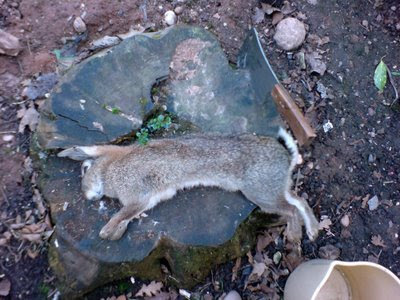 Here's a picture of a dead rabbit on the tree stump outside my flat that I've been using as a butcher's block. Rather than gather them up in my hands, after I've chopped the head, feet and tail off, I use the plastic bucket to carry these parts to the bin. The meat cleaver is one I got from Ebay for about four quid. I've tried to make it sharp but have - by and large - failed. At the time I thought, well, this is, again, just going to send the 'wrong message' - but this seems a little bit crazy to me now. It's just a part of what happen when you hunt rabbits, and pretending it doesn't - pretending that it's a tidy business a lot like going to the local supermarket, well - it just isn't. That's not to say that it's horrific and a fit activity for would-be psychopaths either - that would be to fall into the error of simply wishing to shock for the sake of it. Looks like a standard outdoor picture to me. Nothing over the top. Nothing that foretells dishonesty or cruelty. It is what it is, nothing more nothing less. I was removed to protect my email from hooligans, not because I insulted the rabbitman, in case anybody wonders....I have it in writing.